“Fresh Start” shoeboxes is an engaging volunteer opportunity for individuals, families and groups of any size—all you need is a shoebox! We invite you to decorate a shoebox and fill it with small necessities that can help keep a homeless man or woman clean and safe. Remember that being homeless often means having no access to supplies we take for granted. **If you do not have a shoebox, you may put all the items in a large Ziploc (2 or 2.5 gallon) bag instead of using a box. If you are unable to create a drive but would like to help now, Click Here to provide Shoeboxes, care, and other services now! Why is your help important? 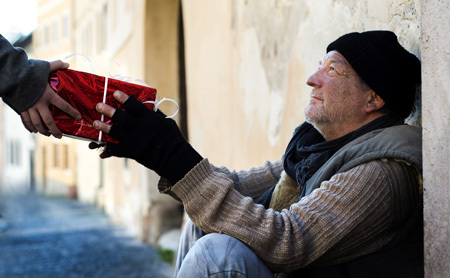 Homeless people often come to us with few personal belongings. With your support Central Union Mission can provide for even more of these folks’ basic needs for shelter, clothing and hygiene products. What will the shoeboxes mean to those the Mission serves? Your “Fresh Start” box is a gracious act of support for those struggling in the Washington metropolitan area. Please choose to fill your box for a woman or a man, and then decorate it with construction paper, crayons or any way you prefer. You can include encouraging notes or Bible verses, too. How will homeless people benefit from what is inside? Some who receive the box will have spent days walking and sleeping outdoors and will welcome comfortable socks, lip balm or a rain poncho. Others will have come to our doors with damaged shoes needing bandages or ointment to care for their tired feet. Still others will be happy for a can opener to prepare the nonperishable items they may have been offered in their travels. For more information on how to help, please contact Rev. Deb Chambers dchambers@missiondc.org.